The sprint – a long, long, hot day that started at 6am so we could get the specially laid on ferry to Burano Island for the qualifying heats. Sadly these were not exactly a great success from the NZ point of view, with only Lizzie running to form and cruising into the final in 6th place in her heat. Greta was right up with the pace in heat 3, but a 1 minute mistake was the death knell for her qualifying chances, and Imogene was steady but always just off the necessary pace. The real drama was with the men where complaints and then protests were laid by Canada, Finland and ourselves. These related to two issues, a mapping one which Ross felt cost him his race (up until then he was in the top 4 of his heat), and the other where a narrow alley mapped as open actually had a gate across it. This latter one saw the demise of last year’s mens champion Martin Bostrom and was the root of the Finnish protest. Unfortunately for New Zealand’s chances in the mens race all protests were dismissed, leaving us with no qualifiers other than Lizzie. So to Venice itself and, with the day getting ever hotter, the final. 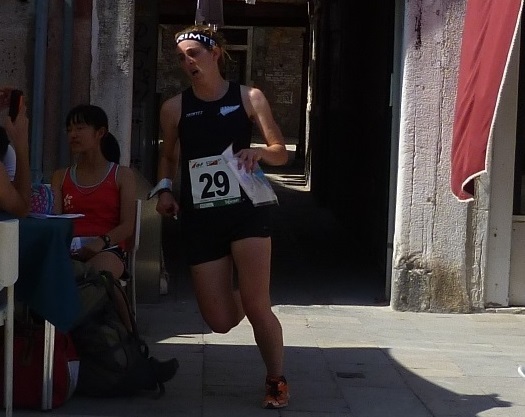 Lizzie ran another good race for 13th (making her last 4 WOC sprints 11th, 9th, 14th and 13th) but felt the course, with several sections of minimal navigation in favour of dead running worked against her getting a higher place. Nontheless she was loudly cheered by a surprisingly large Kiwi contingent including the majority of the JWOC team. The finish arena itself, right on the lagoon edge was a bit cramped for good viewing, except for the lucky passengers on at least two enormous cruise ships which towered above the proceedings! 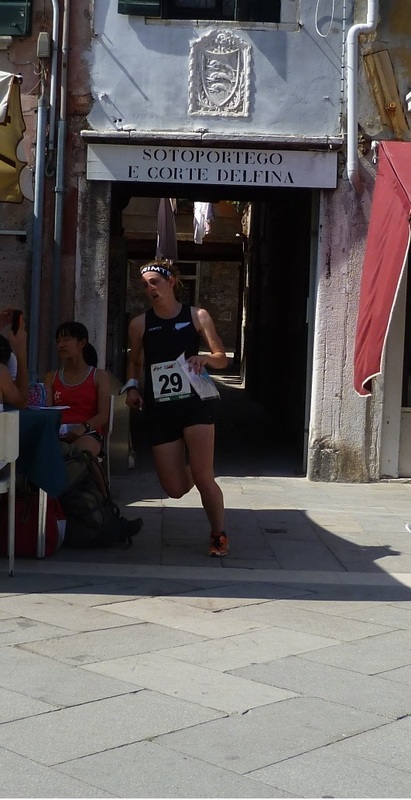 Tomorrow we move back to the mountains to ready ourselves for the Mixed Sprint Relay – a new event at WOC – which promises to be an exciting tussle in the streets of Trento early morning Tuesday NZ time. Although, on the basis of today, the Danes and the Swiss look pretty formidable, Greta, Tim, Matt and Lizzie have a realistic shot at the top 10 if they can pull out all the stops. We will see….